I will be up front on this one. I’ve historically not liked most DC films, especially since Zack Snyder got involved with them. Wonder Woman was the one glaring exception. The overly dark “Murderverse” aspect to them was extremely off putting. Not everything DC needed to wreak of Batman. Between my love of Wonder Woman and the fact that Joss Whedon had taken over the project part way through, my interest was peeked. I signed up for and received advanced screening tickets for Justice League. You can absolutely tell that Justice League is a transitional film, that DC was switching gears and that two very different people were at the helm. It isn’t quite the hope and light of Wonder Woman, but it isn’t overly dark like previous offerings. DC has been listening to their fans on this. Humor is sprinkled throughout the film, but it’s pretty obviously been tacked on after the fact. Some of it is outright forced. Through judicious use of the editing room and re-shoots, they’ve managed to make most of the humor flow. Our entire audience laughed several times. The Flash is pretty slapstick, which is in line with his role in print. Aquaman and Cyborg both get in a few really good jokes as well. Batman’s jokes seemed off and out of character. Wonder Woman was the most serious member of the team. The story was pretty straight forward and predictable. A team of disagreeing and disparate heroes forced together by an alien invasion. Tell me if you’ve heard this one before. Everyone (even Batfleck) carried their characters well within the script/s provided. I’m still crushing on Wonder Woman as Gal Gadot continues to own the heck out of that role. I really like Jason Mamoa’s version of Aquaman. It truly makes him the powerhouse that he should be and makes a whole lot more sense than a Nordic fellow in orange and green. Ezra Miller’s Flash was a little forced and awkward, but that appeared to be on purpose. He is supposed to be very young and new to this whole superhero thing, basically this team’s Spiderman. 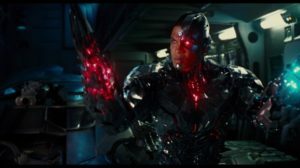 Ray Fisher’s Cyborg was extremely stiff. It kind of worked for the man and machine mix of the character, but it made the emotional interactions unwieldy. Ben Affleck and Henry Cavill kind of phoned it in. If you liked them in the previous movies, you will like them in this one. If you didn’t, you still won’t. I want to address a controversy that broke over the weekend about the Amazons. Other than a few (mostly in the background) characters, they eliminated Snyder’s bikini costumes. The Amazons are largely in versions of their Wonder Woman costumes. The bikinis that remain are in background roles or in places where re-shooting or editing the scene would have been prohibitively expensive. Stay through to the end of the credits. It is a Joss Whedom film after all. There are two credit scenes. 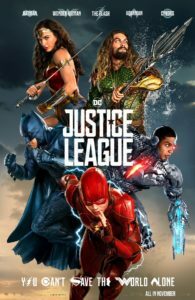 Justice League is a formulaic, but fun superhero movie… which is a huge improvement over most of the rest of the Snyderverse. Wonder Woman still is the golden standard for the rest of DC to reach for or exceed. I give it a solid (3.0 / 5).